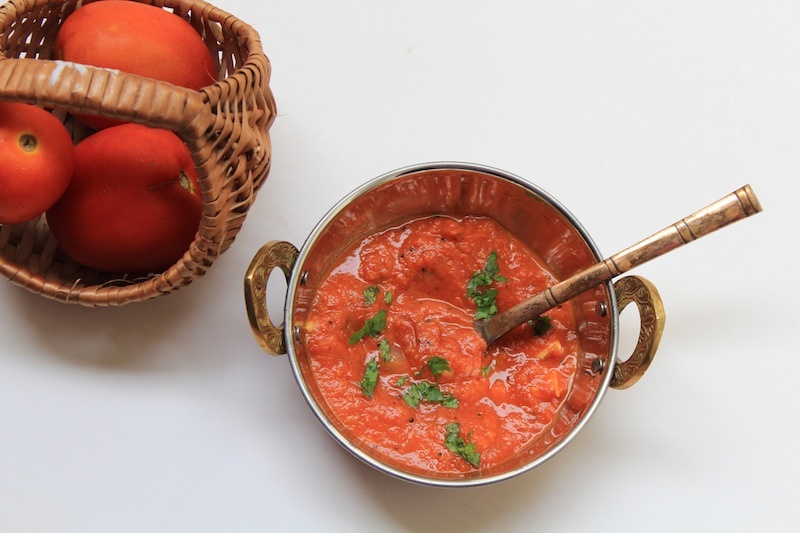 South Indian tomato based and tamarind based curries have a lovely tangy spicy flavour. Such curries are a good substitute for lentil based dishes like sambar. Make a small cut on the tomatoes place them in boiling water for 10 mins. Add mustard seeds, once it pops add asafoetida powder and curry leaves. Now add crushed garlic pods and fry it till the raw smell disappears. Add the shallots to this and fry it till it is transparent. Now add the pureed tomatoes,sambar powder and salt and allow it to boil well. At this stage add the tamarind paste to this and let it boil for a few more minutes. Serve hot with steamed rice or puris! The quantity of tamarind paste needs to be adjusted depending on how sour the tomatoes are. So i generally start off with half a tsp gradually increasing it based on requirement.